All of this weekend has led to this point for our Dragon Duelists! 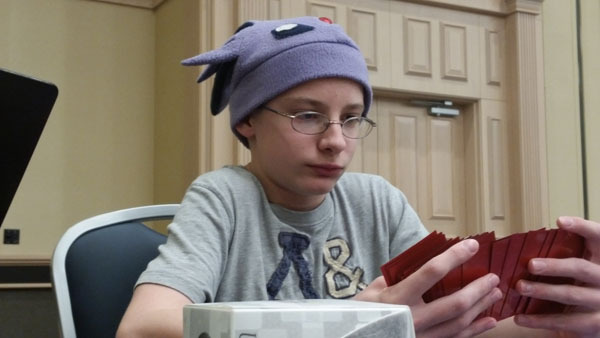 Jackson Sayre won the Dragon Duel tournament yesterday, while Michael Sakowicz won today’s tournament just mere moments ago. Both are winners, but only one gets the official title of YCS Chicago Dragon Duel Champion! They used Sealed Decks in their main tournament Duels, but this playoff game is using their Constructed Decks. Since each of these Duelists are Dragon Duel Champions of the past, this should prove to be a great game. Sayre won the dice roll and chose to play first. He Set four to his back row. Sakowicz’s hand was Goblindbergh, Vanity’s Emptiness, Elemental HERO Shadow Mist, Forbidden Chalice, Summoner Monk, and Solemn Warning. He started off with Goblindbergh, and it was hit by Fiendish Chain. Sakowicz Set his Trap Cards. Sakowicz drew Form Change. He played Summoner Monk, and activated its effect. Forbidden Chalice was discarded to bring Elemental HERO Shadow Mist in Defense Position, and it activated its own effect to add Mask Change from Sakowicz’s Deck to his hand. Next, Sakowicz stacked Goblindbergh and Summoner Monk for Number 101: Silent Honor ARK! Silent Honor ARK attacked, and was banished by Dimensional Prison! Sakowicz Set Form Change and Mask Change. Sayre played Satellarknight Deneb and used its effect to get Satellarknight Altair. In the End Phase, Sakowicz flipped Mask Change, and Sayre Tributed Deneb for Stellarnova Alpha. Sakowicz drew another Mask Change! He put Shadow Mist to Attack Position swung directly, and Sayre flipped Call of the Haunted, targeting Deneb. Sakowicz responded with Mask Change, sending Shadow Mist to the Graveyard to bring forth Masked HERO Dark Law! Deneb hit the field, and Deneb’s and Shadow Mist’s effects each activated. Sayre searched out Satellarknight Rigel, and Sakowicz got Elemental HERO Bubbleman. Still in the Battle Phase, Dark Law attacked Deneb, banishing it. Sayre flipped Mind Crush as the Battle Phase ended, hitting Bubbleman. Sakowicz Set Shadow Mist to end the turn. Sayre played Rigel and used its effect on itself. It attacked Dark Law, but before damage calculation Sakowicz used Forbidden Chalice on Dark Law to win the battle! In Main Phase 2, Sayre used Raigeki to clear the board. Sakowicz used Shadow Mist to add Elemental HERO Neos Alius to his hand. Sakowicz drew A Hero Lives, and paid 4000 Life Points to activate it! He Special Summoned Shadow Mist from the Deck, and it added Mask Change to his hand. He played Neos Alius as well, and moved to the Battle Phase. Shadow Mist attacked directly, and Mask Change swapped Shadow Mist with Dark Law. Neos Alius and Dark Law attacked directly, and Sayre had only 1400 Life Points left! Sayre played Satellarknight Altair, and Sakowicz dropped to 2000 Life Points to use Solemn Warning! Sayre had no choice but to concede! Sakowicz takes an early lead, thanks to some big Mask Change plays! Sayre decided to play first. He Set three cards and played Deneb, searching out Altair. Sakowicz’s hand was Miracle Fusion, Mind Crush, Solemn Warning, A Hero Lives, Form Change, and Mask Change. He paid 4000 Life Points for A Hero Lives, and was blasted by Stellarnova Alpha! He Set Miracle Fusion and Mind Crush. Sayre played Altair and lost it to Solemn Warning. Sakowicz had already paid himself down to 2000 Life Points, and Sayre flipped Oasis of Dragon Souls! It revived Altair in Defense Position, which brought Deneb along with it, also in Defense Position. Deneb let him search out another Altair. He Xyz Summoned Constellar Omega, but couldn’t attack due to Altair’s lingering effect. In the End Phase, Sakowicz played Mind Crush to hit the Altair in Sayre’s hand. Sakowicz drew Neos Alius! He Summoned it and played Mask Change, bringing out Masked HERO Koga! He banished Neos Alius for Koga’s effect, and got hit by Fiendish Chain. Sakowicz activated Form Change, swapping out Koga for Masked HERO Divine Wind in Defense Position! On Sayre’s turn, he used De-Fusion! With Divine Wind out of the way, Constellar Omega was free to finish Sakowicz off! It’s an even Match! This final Duel will determine who walks away with the Dragon Duel Championship Trophy! Sakowicz went first, with a hand of Goblindbergh, E – Emergency Call, Kaiser Colosseum, Vanity’s Emptiness, and Summoner Monk. He Normal Summoned Goblindbergh, and immediately lamented his decision. He had to go with it, and Special Summoned Summoner Monk. He discarded E – Emergency Call with Summoner Monk, bringing Elemental HERO Shadow Mist to the field. That let put Mask Change in his hand. He stacked Summoner Monk and Goblindbergh for Number 101: Silent Honor ARK, activated Kaiser Colosseum, and Set Vanity’s Emptiness and Mask Change. In the Standby Phase, Sakowicz’s Mask Change traded Shadow Mist with Masked HERO Dark Law, and Shadow Mist searched for Elemental HERO Bubbleman. 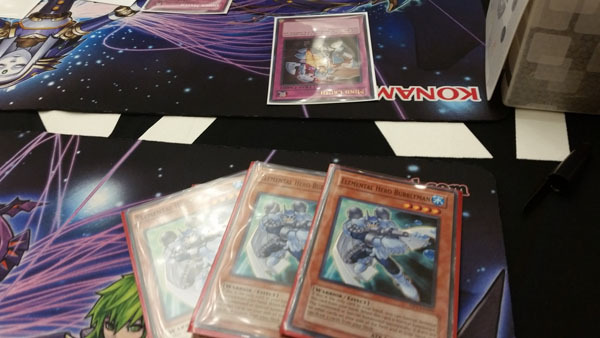 Sayre used Reinforcement of the Army to get Satellarknight Deneb, and Dark Law made Sayre banish Gozen Match from his hand. Sayre Summoned Satellarknight Vega, and Sakowicz Chained Vanity’s Emptiness! Sayre Set two to his back row. Sakowicz drew Miracle Fusion. Silent Honor Ark attacked Vega, and Dark Law hit directly. Sayre played Satellarknight Deneb, searching for Satellarknight Rigel, and Dark Law banished Rigel from the hand! Sayre Set a back row card. Sakowicz drew Compulsory Evacuation Device. He sent Silent Honor ARK to take out Deneb, and Dark Law attacked into Dimensional Prison! Sakowicz Set Compulsory Evacuation Device. Sayre played Altair and passed. Sakowicz drew another Bubbleman. Silent Honor ARK attacked Altair, and Sayre used Honest to keep his Altair around. Sakowicz detached an Xyz Material to save his Xyz Monster. Sayre Set a third back row card and put Altair in Defense Position. Sakowicz drew his third Bubbleman. He attacked Altair with Silent Honor Ark. Sayre Set a monster and passed. Sakowicz drew Goblindbergh and attacked Vega. Sayre Set a back row card. Sakowicz drew Reinforcement of the Army. Silent Honor ARK attacked directly, leaving Sayre with only 2000 Life Points. Sayre Set a fifth back row card. Sakowicz drew Breakthrough Skill. Silent Honor ARK attacked, but was blocked by Fiendish Chain! Sayre was still in this Duel! Sakowicz Set Breakthrough Skill. Sakowicz drew Mind Crush. He played Reinforcement of the Army to search for Neos Alius, and when Reinforcement hit the Graveyard, Vanity’s Emptiness was finally destroyed! Sayre flipped Mind Crush, nailing the Neos Alius. Sakowicz played Goblindbergh, and Sayre flipped Gozen Match. Sakowicz sent Goblindberg to the Graveyard. Sakowicz drew Reinforcement of the Army, and Sayre used Mind Crush to hit all three copies of Bubbleman! That only helped, because Sakowicz used Miracle Fusion, combining two copies of Bubbleman for Elemental HERO Absolute Zero! Sayre couldn’t stop Absolute’s Zero’s attack! 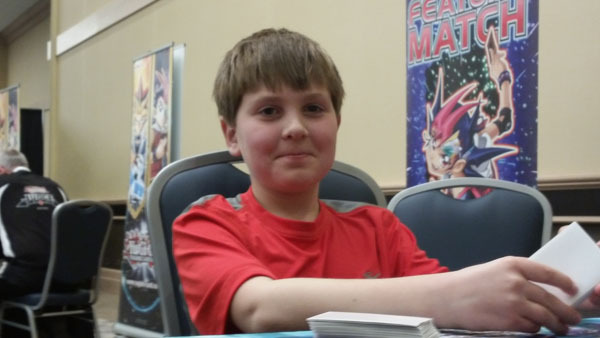 Michael Sakowicz is your YCS Chicago Dragon Duel Champion!